A collection and selection of my writing, reading, views and news. For the man who still leads from the front even although he’s lost inside. For the man who was fired for his fourth late because he has been awake for a straight week with a sick child. For the man who makes an "extra stop" after work every evening, to get something to make his woman smile. For the man who is mourning the loss of a pregnancy that nobody else knew about. For the single dad who doesn't know how the utilities are going to stay on this month. For the man who has gone through 2 IVF's and has tried for five years without success but still is happy for his friends whose women throw baby showers. For the man who still hasn't forgiven himself for the abortion for the abortion of his child 20 years ago. For the man who has a line of judging eyes on him and his children as he counts out coins or has to put something back at the supermarket. For the man who opens the door to the news of his wife being killed overseas three weeks before she was to return home. For the man who lives with a quiet anxiety because nobody understands what he could possibly be stressed about. For the man who gives to his family all day, everyday even when he’s not with them. For the man who smiles at strangers all day in public, but weeps silently every night. For the man who has wanted to end it all but found strength to carry on. For the man who hears the rumours about himself, but chooses not to retaliate. For the man sleeping next to a stranger every night. For the man whose genetics will never allow him to look like the ones in the magazines. For the man that endures one broken relationship after another because there was no mother around to teach him what love looks like. For the man raising a motherless son and praying that history doesn't repeat itself. 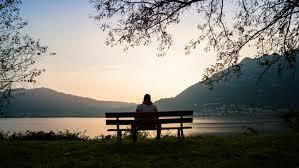 For the man who loves with all his heart who is desperate to be loved in return. For every man who cries in the shower so that nobody else can see, because if he isn’t strong, nobody is. Just because the water washes your tears doesn't mean that you don't cry. Just because you cry doesn’t mean that you’re not strong enough to handle it. Stay strong, be happy, be loving and love life. 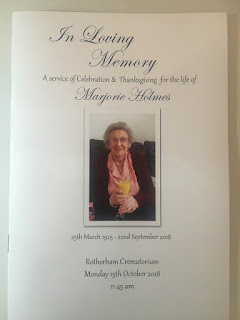 After what has seemed a very long three weeks and two days, my Mam, Marjorie Holmes's funeral was held yesterday. A beautiful service just as she wanted was held at the Crematorium in Rotherham, led by Rev Mick Neal and arranged with the help and support of Jeremy Neal Funeral Director. Thank you to everyone who came to the funeral and all those who sent kind messages of love and support to us all. Dear God, Thank you for allowing us to have the best grandma ever ! A friend as well as a gran, who was always there for us, even at the end when at 93 you'd think she would be a bit selfish and cantankerous, and definately be entitled to, but no. Only 2 weeks ago I was moaning to her about all the mundane jobs I had to do before work - the ironing and washing etc. and she placed her hand over mine and said, "Don't worry, you can do it" ! One of her most known phrases was "sorry for being a nuisance". Always thinking she's a nuisance when she's not ; she couldn't have been any less trouble if she tried and it was a privilege to be able to spend the last 3 years just down the road from her. "I would not believe government papers"